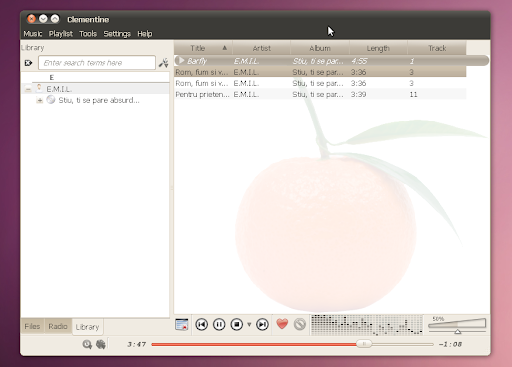 Clementine is a music player written in Qt4 which looks a lot like Amarok 1.4. It doesn't come with too many features for now but Amarok 1.4 nostalgics will definitely like it. Clementine 0.3 was released just a few hours ago and brings a few big changes: it now uses Gstreamer to play music, a new equalizer, cross-fading, gapeless playback, you can now control Clementine using the command line, undo and redo in the playlist and a lot more. A complete list of changes in version 0.3 can be found HERE. Clementine may not have all the features in the world, but for such an early version it looks great! For another music player designed with Amarok 1.4 in mind, see also Cuberok. Thanks to Linux Freedom For Live!